Sahib and the Crew Save the World: 7.5 Million People Want to Kill You! Scary thought right? The very concept that 7.5 million people actively seek your death is an idea that should give anyone pause. Well, the good news just keeps coming. They don't just want you dead, but your family, friends, co-workers, and neighbors as well. Who are these people and why do they want to kill me, you might ask. There is a single answer to both questions. They want you dead because they are Muslim and you are not. This is the "Moderate" 95.5%.... ? I can hear it now, "Whoa, Sahib! Islam is the religion of peace. Dear Leader Obama says so! Even GWB said we are not at war with Islam. It's just the Islamist terrorist whackos that want us dead. Besides, Christians had the Crusades and the Spanish Inquisition. (Nobody expects the Spanish Inquisition!)" Excellent points all. However, the rest of the world seems to have moved beyond the 17th century, perhaps it is time for the Muslim world to do so as well. Time for a remedial math lesson. I'll keep it simple for KCMO public school attendees. Depending on the source, there are conservatively 1.5 billion Muslims in the world. Say one half of one percent of those Muslims are Islamist terrorist whackos, (hang on while I do my guzintas, always wanted to be a double naught spy or a brain surgeon not a mathematician) that gives us a nice round number of 7.5 million certified Islamist terrorist whackos. I'll give that some time to sink in.... Even if my estimate is off by a factor of 10 (which I sincerely doubt), that's still a whole lot of people seeking our demise. Liberals and CAIR would say that I'm being an incendiary Islamaphobe. 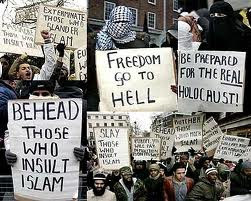 Well, let's just take a stroll down memory lane and take a look at some of the highlights of the followers of the "religion of peace", shall we? Guess what people? These are not the result of terrorist attacks! These incidents have been committed by the "moderate" 99.5% of the world's Islamic population. And we are surprised that they do not display outrage when the Islamist terrorist whackos kill a bunch of people in a terrorist attack? A perfect example of the dichotomy between the Western and Islamic world is the difference in how each group reacted to recent events. Twenty-eight Americans were murdered in Afghanistan because a couple of books were burned. The majority of the Afghani people have no problems with that. Sixteen Afghani civilians are killed by ONE soldier, and the Western world is appalled and saddened. So what can we do? The free nations of the western world can stand up against the tide of "creeping shariah" and political correctness that emboldens those who seek our destruction. If you want to immigrate to one of our countries for a better life, great! You become an American, Canadian, or citizen of the UK. You support your country and your fellow citizens, regardless of the god you or they pray to. You do not demand special treatment or exemption from the laws of the countries you now call home. On this, we must insist. Our tolerance has become a symbol of weakness. The welfare of the many must no longer be sacrificed to the will of those who wish us harm. You are with us or against us. Treat your neighbors with respect and dignity and they will treat you likewise. Feel free to worship as you wish and allow others to do so as well. Otherwise, no quarter will be asked and none will be given. And if you don't like it? Allah be with you, because no one else will be. Thanks Nicco! The country definitely seems to be at a cross-roads. Hopefully, getting Obama out of office will be a step in the right direction. Woo Hoo! With the death of Mohamed Merah, we are down to 7,499,999.